Dead fish washed up on Florida beaches during an outbreak of red tide along the Gulf Coast. 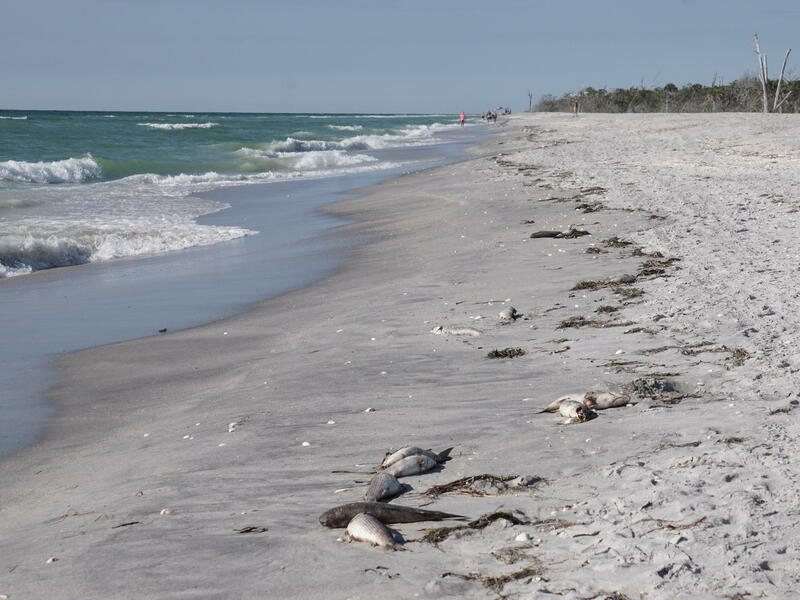 For well over a year, visitors to Florida's beautiful Gulf Coast beaches have found dead fish lining the shoreline. A red tide algae bloom afflicted coastal communities from Florida's Panhandle to its southern tip. But in the past few weeks, monitoring conducted by marine scientists shows that the red tide bloom is finally disappearing. Red tide blooms occur when a microscopic alga, Karenia brevis, proliferates in a higher than normal concentration. When concentrations are high enough, toxic chemicals released by the algae can affect marine life and people. "We've seen a much reduced number of cell count samples that have elevated Karenia brevis," says Vincent Lovko, a staff scientist at Mote Marine Laboratory and Aquarium in Sarasota. "That does seem to indicate that the bloom has largely dissipated." Lovko says satellite photos don't show any significant red tide bloom patches offshore in the Gulf. While there is still some red tide being detected in southwest Florida in the Ten Thousand Islands area, scientists say that even there, the concentrations of Karenia brevis are dropping. 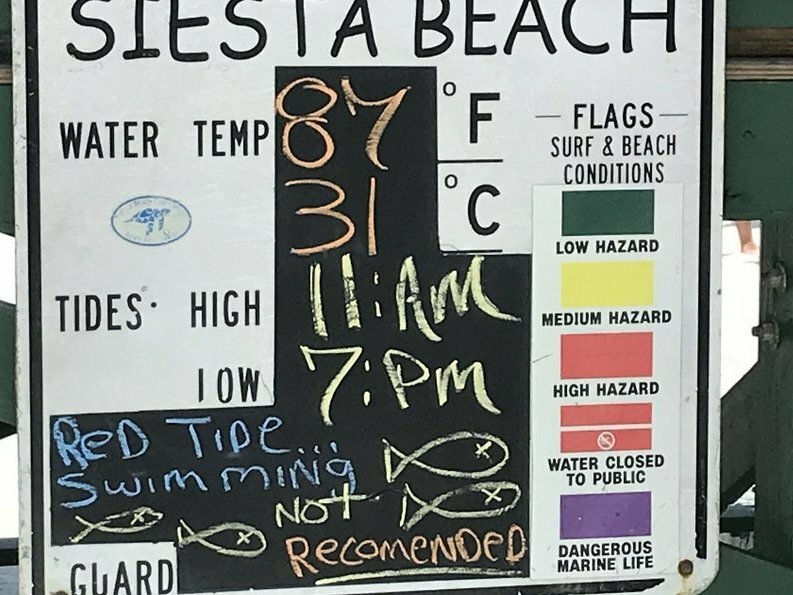 A sign at Siesta Key beach cautions beachgoers to avoid swimming in the waters affected by red tide. The dissipation of the latest red tide bloom comes as a relief to communities along Florida's Gulf Coast gearing up for the spring tourism season. In Sarasota County, revenue from tourism was down significantly in the last quarter of 2018 compared with that of the previous year. Manatee County last year also saw a small decline in the number of visitors compared with in 2017, a drop officials attribute to red tide. "It's going to take some time to get visitors to comeback," says Erin Duggan with the Visit Sarasota tourism organization. "There's a little bit of a hangover from red tide." In nearby Manatee County, Elliott Falcione of the Bradenton Area Convention and Visitors Bureau says there has been little sign of red tide now for about six weeks. "It's frustrating that we still are seeing it written in the local publications," he says. "The media is still talking about red tide, and really, that's hurting our business more than anything else." Falcione says the bureau is getting the word out with a series of marketing campaigns, including one targeting British visitors with ads on taxis and in London's Victoria and Waterloo train stations. In the recent outbreak, nearly 150 dolphins died as a result of the red tide. Red tide is also blamed for the deaths of hundreds of manatees and sea turtles. Since it began in October 2017, hundreds of tons of dead fish have been collected from beaches in Sarasota, Manatee and Lee counties, among others. When red tide nears a shore, wave action breaks up the Karenia brevis cells, releasing their toxins into the air. If concentrations are high and winds blow onshore, respiratory irritation can be severe, causing coughing and tears for beachgoers and for those on the water. As severe as this red tide event was, it's not unusual. A bloom in 2005 and 2006 persisted for 17 months, even longer than this one. Another in 2012 and 2013 killed hundreds of manatees and other marine life. There were also blooms in 2015-2016, 2016-2017 and smaller blooms in other years. "Generally speaking," Lovko says, "we tend to have some level of bloom every year." The impact of red tide is well-documented, going back to the time of the Spanish explorers. The causes however, are not as well-understood. Nutrients from coastal runoff, chemicals that include phosphorus and nitrogen likely play a role. But the connection isn't as clear as it is for other algal blooms, such as the blue-green algae that have recently plagued communities on Florida's east and west coasts.